Join us in the taproom and watch the Packers take on the Lions. 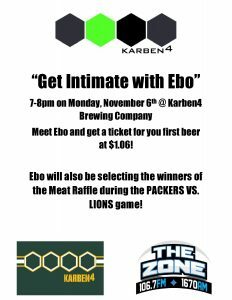 Since it’s game day we’ll have our meat raffle going on with special guest host Ebo from The Zone Madison. Come meet Ebo and get a ticket for a $1.06 pint! He’ll then be helping with our meat raffle and selecting the lucky winners. Meat, Beer AND Ebo…let’s get intimate!